NASA has awarded grants 10 innovative university projects that promise to help the space agency develop the advanced technologies it needs for future long-duration manned spaceflights and research. The agency's Space Technology Research Grants Program will give about $250,000 to each of the one-year projects, with the possibility of another year of funding contingent on technical progress, NASA officials announced Wednesday (Sept. 25). Other projects will explore advanced optics technologies that could help scientists obtain better measurements of distant cosmic objects, which could lead to a better understanding of exoplanets, galaxy evolution and the early moments of the universe, NASA officials said in a statement. 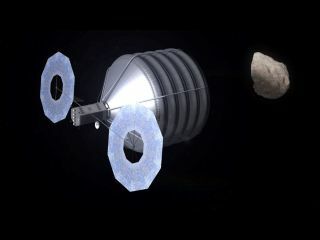 Still other projects will explore new ways to track asteroids that could pose a threat to humanity. These early stage innovation grants are given out under NASA's relatively new Space Technology Program, which was born out of President Barack Obama's fiscal year 2011 budget request. The program is intended to spur innovative ideas from commercial industries, universities and even citizens. "A critical element of America's space technology pipeline rests in the cutting edge research in the early stage technologies conducted at the nation's universities," NASA's Associate Administrator for Space Technology, Michael Gazarik, said in a statement. "Through this investment NASA will continue to benefit from university-led R and D."
Johns Hopkins University, Baltimore; "Detection, tracking, and identification of asteroids through on-board image analysis"
Michigan Technological University, Houghton, Mich.; "A new experiment for determining evaporation and condensation coefficients of cryogenic propellants and development of an efficient computational model of cryogenic film stability in microgravity"
Northwestern University, Evanston, Ill.; "Broadband electrically tunable monolithic mid-infrared laser"
Purdue University, West Lafayette, Ind. ; "Innovations in understanding and modeling cryogenic propellants for long-duration spaceflight"
University of Arkansas, Fayetteville; "Asynchronous A/D converter for in situ instruments operating under extreme environments"
University of Colorado, Boulder; "Comprehensive modeling of the effects of hazardous asteroid mitigation techniques"
University of Florida, Gainesville; "Bio-inspired broadband antireflection coatings at long wavelengths for space applications"
University of Michigan, Ann Arbor; "Broad bandwidth metamaterial antireflection coatings for measurement of the cosmic microwave background"
University of South Carolina, Columbia; "Oxygen recovery via carbon dioxide electrolysis with microtubular solid oxide cells"
University of Utah, Salt Lake City; "A lightweight compact multi-spectral imager using novel computer-generated micro-optics and spectral-extraction algorithms"